The 2015 Rugby World Cup final is upon us, with Australia looking to repeat their victory in the previous World Cup final at Twickenham, back in 1991, and New Zealand seeking to retain the title they won on home soil. It's a delicious match-up and one that could deliver a cracking game to crown a great tournament - the obvious disappointment excepted. So what are the key battles on Saturday, and who will come out on top? The importance of the breakdown in modern rugby is paramount - it decides the whole tempo of the game. The contest between these two back rows is particularly fascinating. Australia's kingpin - and arguably the player of the tournament so far - is flanker turned number eight David Pocock. The 27-year-old has secured 14 turnovers in fewer than four whole matches - five more than any other player. Ably supported by flankers Michael Hooper and Scott Fardy, he has been so persistent at the breakdown. The only way to totally prevent him ruining or turning over possession is never to allow the ball carrier to become isolated from his support. In the chaos and fury of a Test match, even the best organised team in the world cannot always do that. The All Blacks, even with the great Richie McCaw at seven, have to accept that Pocock will get the better of them in that area on occasion. Instead of having some sort of special 'team within their team' tasked with hitting every breakdown or man-marking Pocock, they will take collective responsibility to look after the ball in contact. The All Blacks back row offer something quite different to their Wallaby counterparts. Blind-side flanker Jerome Kaino, number eight Kieran Read and open-side McCaw have carried for a total of 375 metres - Pocock, Hooper and Fardy have managed just 142 metres between them. New Zealand may have progressed from a less taxing pool, but there is also a marked difference in the area those metres are being made in. Kaino, Read and McCaw have all appeared out wide - trusting their skills to create overlaps rather than simply trucking the ball up from first receiver. It is all part of their philosophy of being able to play quicker, cleverer rugby and being able to react faster to an opportunity than their opponents can close it off. It works for the vast majority of the time. Since the last World Cup final, they have lost only three of their 53 matches. I don't think they will change it to counter one player - even one as good as Pocock. Saturday is New Zealand fly-half Dan Carter's chance to land the World Cup final triumph that injury prevented him from securing in 2011. The 33-year-old is playing in his last international before heading to France to play for Racing 92 and has flitted between good and excellent so far in this tournament. He has made a massive impact on some games, while in others he has just done what needs to be done, and made the rest of the team look good instead. Three stellar moments stand out for me - his astonishing back-of-the-hand offload for Julian Savea to score against France, stripping the ball from Schalk Burger to help set up Beauden Barrett's try against South Africa, and that audacious drop-goal in the same match. Can perfect 10 Carter exit in style? He has shown excellent game management - taking on the responsibility when his team has needed him - but sometimes it does not look like he has the pace he once had. In 2005, at the age of 23, he produced perhaps the complete fly-half performance, scoring a record 33 points, including two tries, against the British and Irish Lions in the All Blacks' second Test win. He still makes the odd break, but opposite number Bernard Foley, 26, is now more of a threat as a runner. Foley has made eight clean breaks so far in the tournament - more than any other Australian and three better than Carter. The Wallaby fly-half has been adapt at making those chances count as well, linking well with Israel Folau or - for his second try against England for instance - Kurtley Beale. He plays a great brand of rugby - he can run, take the ball to the gain line, kick tactically and distribute well - and he showed great mental strength against Scotland when he stepped up after an indifferent performance to land the quarter-final's decisive penalty. Off line-outs, he tends to stand out wide in defence with one of the wingers defending the narrow channel close to the set-piece. It could be a weakness, but the All Blacks have not found a way to exploit it in the last two matches that he has started against them at fly-half. I'm not sure they will this time. In the last three finals there have been a total of just four tries. The stakes are so high and the defences of such quality that they are rarely high scoring matches, but equally that means the ability to beat a man one-on-one and create a try out of nothing becomes an even more precious commodity. The stardust in this match is located in New Zealand wing Nehe Milner-Skudder. He only made his debut in the All Blacks' 27-19 Rugby Championship defeat by Australia in August, but scored two tries and has been first choice ever since. He is new, raw, exciting, and all over the place. He is a bouncing bean - you never know where is going next. He can side-step in a tiny amount of space and has electric acceleration. No-one in the Australia side has his zip, but Israel Folau is a devastating runner if he gets the chance. He has suffered with niggly injuries, but I thought there were signs he was getting back to his best against Argentina in the semi-final. I can still remember waking up on the morning of 2 November 1991 - the day of the World Cup final - at our World Cup base of Tylney Hall, the country house hotel we were staying at in Hampshire. I had played in big matches before. I was part of the team that lost a Grand Slam in the final Five Nations match against Scotland in 1990 and the one that clinched one a year later in a tight match against the French. I had also played in two British and Irish Lions Tests in an incredible tour of Australia in 1989. But the World Cup final - especially with it being at home for us - had added weight. I woke up excited. I wanted to get my hands on the ball, run with the ball and leave my mark on such a big occasion. I'm sure that this Saturday morning there will be 46 players - in two different team hotels - waking up with those exact same feelings, as New Zealand and Australia prepare for their World Cup final. Different people have different ways of dealing with big-game nerves. Before we played Australia in the 1991 final, some of our players would get changed really quickly, others would read programmes and take their time. It is not like it is nowadays. Most of the warm-up took place in the dressing room. There was no charging about on the pitch beforehand! There was no more huddling up and shouting than for any other game. If anything it was quieter - the players were more focused on what they were there to do. It is very hard to bet against a team playing as well as the All Blacks have been, not only in this tournament, but across the last four years. In addition Carter has been more reliable off the tee than Foley so far in this tournament, and in such a tight game as I expect that could be crucial. 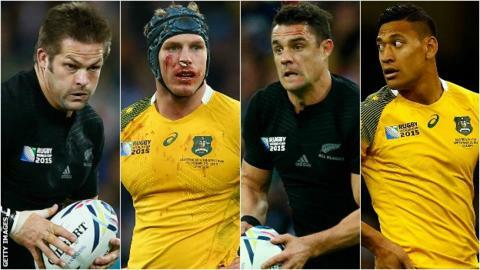 Read more on New Zealand v Australia: Can perfect 10 Dan Carter exit in style?